Displays, displays! 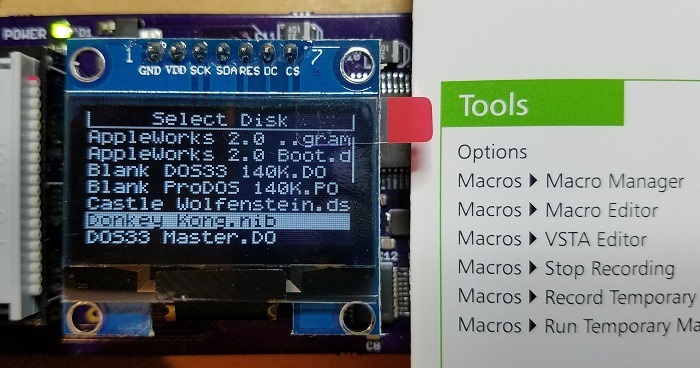 I’ve built a prototype Floppy Emu board that uses a 1.3-inch 128×64 OLED display, instead of the existing 1.4-inch 84×48 LCD. It works, and it looks very nice. So is this the answer to my display worries? Take a look at the photos, and tell me what you think. Why change displays? The current edition Floppy Emu uses an 84×48 LCD that’s a clone of the Nokia 5110 mobile phone display. It’s a decent module with a nice built-in backlight, but the displays have caused me a lot of headaches over the years due to their iffy quality control. Around 10-15% are dead on arrival and must be discarded during manufacturing and testing. A large fraction of the remainder exhibit flaky behavior until the LCD’s pressure-fit connector is manually fine-tuned. These LCD hassles consume too much of the manufacturer’s time and my time. The supply chain for the 5110 LCDs is also problematic, coming only from small eBay and Aliexpress sellers, instead of a major manufacturer who can provide documentation and support. Last month I reviewed some potential replacement displays. There weren’t many great options, but after lots of consideration I settled on this 1.3-inch OLED. It’s similar to the 5110 LCD in many ways, being a 1-bit graphical display with an SPI interface. The physical size is a bit smaller than the 5110 LCD, but they’re close. Unfortunately the supply chain situation for the OLED is even worse than the 5110 LCD, and the cost is at least $2 more per unit. But if I can save myself $2 worth of hassle, it will be worth it. A few weeks ago I hacked up a Floppy Emu board to support the OLED, just to prove that it worked, and today I now have a proper OLED Emu prototype. The first thing you’ll notice about the OLED is that the contrast is amazing. The display is bright and very crisp, and the photos can’t do it justice. I never thought the 5110 LCD looked bad, but the OLED looks far superior. The extra resolution of the OLED helps a lot. Text characters on the 5110 LCD are 3×6, while on the OLED they’re 5×7. This makes possible a more finely-detailed font that’s a nice improvement in legibility. The OLED shows eight rows of text, compared to six rows on the 5110 LCD. This is a nice bonus when scrolling through a long list of filenames. With some extra development work and possible resulting display update slowness, future firmware might be able to trade fewer rows for larger text, but the OLED is designed around eight rows in hardware. So it works. Now what? If I want to move forward with this OLED, there’s a lot of work to do. I need to find a supplier who can reliably provide hundreds of these displays. I need to get my updated PCB to my manufacturing partner. Because it’s a new design, I’ll have to pay them a bunch of money for one-time engineering fees. I’ll need to update the manufacturing instructions, and the test procedure, and the firmware that goes with it. And I’ll need to design a new case to fit the new board and OLED. It will all be a lot of work, and when it’s done my costs will have increased by $2 per unit. Is the pain worth it? Probably yes, but I’m still undecided. I might do some experiments with another display I recently discovered, this COG 12864 LCD. It’s a little bigger than the OLED, which might be helpful, but it lacks the OLED’s excellent contrast and crispness. Its resolution is the same as the OLED, and it’s roughly the same price, and the manufacturing work needed to change displays would still be the same. I’m not sure there’s a compelling reason to choose the COG 12864 LCD over the OLED, but it’s a similar contender. Hmmm. Of course the best option might still be to do nothing, and keep the 5110 LCD. Yes it’s a headache, but it’s a headache I’m familiar with and have dealt with successfully for four years. A new display would bring its own set of headaches through required manufacturing changes and case redesign, so I’m going to have headaches no matter what! But when I think about the best long-term solution, I’m drawn to the idea of a more reliable, better looking OLED. I really like the OLED display with the 5×6 font. Seems like a clear win from my (user) side. Would probably get me to buy another (3rd) floppy emu, as well. Thanks for all of your hard work on this fantastic and irreplaceable classic Mac accessory. It might be worth it to make a upgrade kit for the display. Like a firmware update for the display, a new case and a spacer board for the display. and what I mean for spacer board is, a circuit board about the same size as the new display that moves the pins do it can fit on the new one. I don’t know how many people would buy it but in theory it would work and some people (including me) would buy it. I like the 5×6 font, too, but here’s my suggestion, as an old 8-bit game coder. Assuming you can use the top row of pixels without it looking ugly, move the characters up so the ascenders use the top row in the 5×8 block and let the descenders use both pixels below the baseline. If there’s a ‘g’ right above a ‘B’ or the like then they’ll bump into each other, but it still reads pretty well, and then you won’t really have to jack up the characters that have descenders above the baseline. Hope my ASCII art survives this. OLEDs are wonderful to look at; I hope you find this one (or another) suitable for use. I definitely prefer the 5×6 characters to the 5×7. I’m interested in ken’s comment above about descenders…but I’d have to see them in use before I could say whether I’d opt for them over the 5×6. Thank you for a fine product, and for the work you do both in supporting it and in making it even better. I’ve not seen either type of display in person, but solely going by the screenshots, it certainly looks a lot cleaner on the higher resolution! I came to point out the same thing as Wesley, but he beat me to it. In case you haven’t thought about it — I’ve worked with a dev board with a similar 128×96 OLED display and the manual warned me that screen burn-in could occur. The default firmware for the board would power the screen off after a while to help prevent it. Maybe OLEDs have improved since then, dunno. This was back around 2010 or so. It does look really nice! One thing I’ve always liked about OLED displays is they have really nice viewing angles. 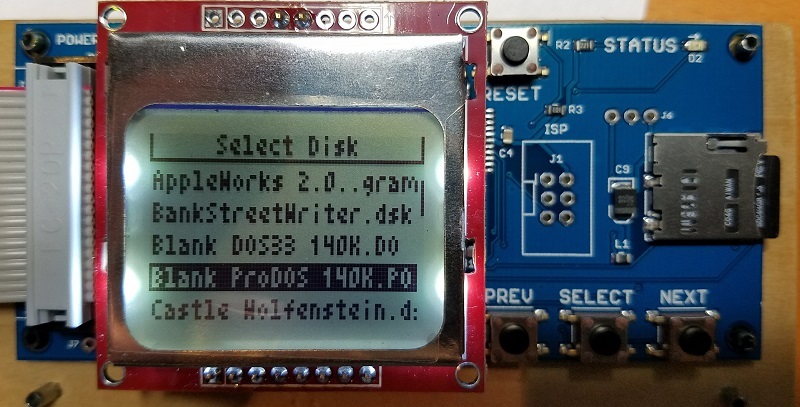 I’m very drawn to the OLED display, and it would represent quite a visible upgrade to a new revision of the Floppy Emu. A big deciding factor would be if you can count on greater reliability. Is there a scenario in which you have the same failure rate with these displays as you do with the current LCDs? If you do decide to make a new version, now is your chance to add any new features since you have to make a new board anyway. I liked the font with the space in-between the rows best. For new features, you could add daisy chaining and/or emulating multiple drives daisy-chained at once. 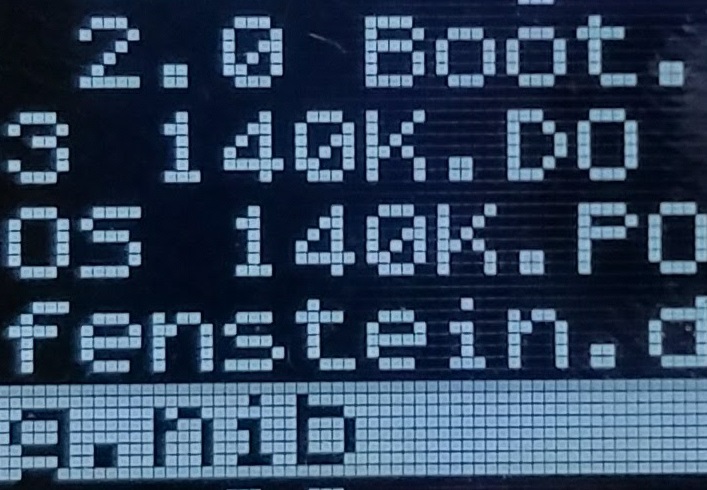 It would be cool if it could even support being the boot drive on Slot 6, D1 and separately plug into the external port and be a hard drive/second 5.25, or a 3.5 drive (speaking about a IIc in my case). OLED prototype dev continues to move forward slowly. The good news about the font is that it’s just software, and can be tweaked or changed at any time. I’ve seen discussions of “image retention” on OLED televisions, which is like a non-permanent burn-in, but I’m not sure if that applies to 1-bit displays like the one here. I haven’t noticed any issues during my testing, but if it becomes a problem I could implement an auto-power-off like Doug mentioned. The goal of this change is selfish, and is 100% to make my life easier. If people prefer the look of the OLED, that’s a bonus, but my real goal is to eliminate all the time I waste in adjusting and screwing around with the Nokia 5110 LCDs. I’ll probably also modify a few other PCB components for easier manufacturing based on my experience with the current board, but they’ll be minor changes. This isn’t intended to be a redesign of whole system, or a replacement with a different model or combo of chips on the PCB, as that would be a much much larger project. I just found your site/product last month and have been debating a purchase. Any thoughts on a timeline for the OLED version? It looks 100x better than the LCD, and definitely seems like something worth waiting a couple of months for. Also, random unrelated question: is there any reason a similar translator couldn’t be built to connect the 8-pin mini DIN network connector on a Mac Plus (or later Mac) to an Ethernet network? If it goes forward, the OLED probably wouldn’t be ready until sometime in the fall. I still need to decide if this is really something I’m going to do, because it’s a large amount of work and extra engineering costs, as well as a permanent increase in parts costs, so it’s not an obvious win for me. There would probably need to be some hand-built beta test units first, and supply issues to resolve, and then actual manufacturing. So this would be a long-term time horizon thing. I wouldn’t say the OLED looks 100x better than the LCD, or even 2x better. Its higher resolution is nice, but the effect is mostly lost at real-world viewing distances, and its smaller text size somewhat cancels out the extra resolution. The zoomed-in photos shown here tend to exaggerate the blockiness of the LCD, while also making the OLED text look bigger than its true 1.9mm height. It’s hard to make an apples-to-apples comparison, but I would say the real-world readabilty is roughly the same for both. Don’t get me wrong, I like the OLED too, but I wouldn’t say it’s a huge or important difference. Especially not for a device where you’re only looking at the screen during setup and configuration anyway. Sign me up for the new display also. The FloppyEmu is invaluable to ancient Apple enthusiasts and greatly appreciated but the display is it’s achilles heel for sure – especially to aging eyes (I have to wear 2 pairs of glasses when using it). I’m constantly fiddling with the screen – lightly pressing on it, gently tugging on it and either way it always seems to fade out or get a solid black square. Which leads me to asking, is there a more stable drop-in replacement display I can use for the current (model B) FloppyEmu?